Illegal logging trade increases as an unintended consequence of raw log export ban. The demand from Chinese carpenters is for raw logs, which are easier to carve into traditional designs in Chinese workshops. Mozambique - Illegal activity in Mozambique’s forestry industry has increased alongside a surge in Chinese demand for Mozambican timber, leading to negative effects for the industry and for the sustainability of the country’s forests. But this could help spur timber and trade policy change, researchers say. Since China imposed a domestic logging ban to preserve its own forests in 1998, its expanding economy has steadily become hungrier for African wood. “China’s demand for timber has increased dramatically over the past 20 years, so that today, more than 80 percent of Mozambican timber exports are destined for China,” wrote the authors of Chinese trade and investment in the Mozambican timber industry: A case study from Cabo Delgado Province, conducted by the Center for International Forestry Research (CIFOR). Much of the Mozambican wood sought by China is jambire, used to make antique-style furniture popular in the Chinese market, according to companies interviewed for the study. While Mozambique’s forestry sector was specializing to supply that niche, the national authorities banned the export of raw logs in 2007, intending to increase local timber processing and create jobs in sawmills in the southern African country. Yet researchers found that the demand from Chinese carpenters is for raw logs, which are easier to carve into traditional designs in Chinese workshops. “Processing timber locally in Mozambique into products that meet the Chinese demand is considered difficult due to a lack of the skills needed to produce such furniture,” researchers wrote. “The log export ban seems to have been implemented without sufficient research, and it is actually decreasing the value of Mozambican exports,” said Sigrid Ekman, the publication’s lead author. An unintended consequence of the policy is to encourage illegal exports of first-class logs, which the scientists found to be profitable. According to their estimations, the profit on a container of raw logs taken illegally from Mozambican forest to Chinese market is much higher than the profit on a container of sawn wood. This takes into account not only shipping costs but also the bribes distributed to ensure local officials look the other way. The intersection of Mozambican forestry policy and Chinese business practices has highlighted problems in the attribution of logging titles, according to the authors of another CIFOR paper exploring the differences between concession holders of various nationalities in Cabo Delgado. According to available statistics, Chinese companies operate nine of the province’s 30 concessions in 2010. Concessions are long-term, large-scale logging titles granted to companies that submit detailed forest management plans — in contrast to simpler, short-term licenses, which are reserved for Mozambican nationals. In recent years, the Mozambican government has promoted concessions to encourage sustainable practices and attract more stable investors to the forestry sector. For this analysis, the scientists studied the concession-level data from Cabo Delgado and found that one in three operated without having obtained the authorities’ approval on the way they were planning to exploit — and preserve — forest resources in their area. This tallied with anecdotal evidence gathered through interviews in the sector that some Chinese operators were willing to “find shortcuts to circumvent the legal requirements,” said CIFOR researcher Sheila Wertz-Kanounnikoff, the paper’s lead author. In the absence of approved management plans, logging companies operate without knowing how many trees of each species stand on their concessions nor how many can be cut without harming the forest’s capacity to regenerate in the future. Poor enforcement also hampers controls on shipments and affects the ban on unprocessed timber exports. Previous research by Wertz-Kanounnikoff, using available trade statistics, showed that since 2008, the quantity of exported logs in total timber exports from Mozambique to China is three to five times higher than the officially recorded number. Ekman et al. linked this discrepancy to the side effects of the log export ban: “The research findings reveal strong incentives for exporting timber illegally as logs, as processing is virtually unprofitable,” they wrote. Yet the recent research also identifies avenues to remedy those problems. Although some Chinese concession holders were found to only leniently comply with legal requirements, Wertz-Kanounnikoff pointed out that they still sought formal logging titles instead of taking advantage of poor law enforcement to source fully illegal timber. “I see it as an opportunity: There is a willingness to bring timber to legality before it is brought to market and export,” she said. Meanwhile, the Chinese government has been developing guidelines for sustainable practices among its overseas investors, but “many have never heard of them,” Wertz-Kanounnikoff added. Over the long term, the researchers said, Mozambique needs to weigh the economic benefit of its international timber trade against the ecological effects of logging as it is currently practiced, and find new ways to generate income from the sector without damaging the natural resource base and the local environment. 1 The (social and environmental)drama associated with the “dramatic” increase in China’s imports of timber during the last 20 years has taken place not in China but in tropical producing countries and Russia. Greed (/profit) – not need – has driven China’s apparent demand for that timber, especially that which is illegal and/or from unsustainably managed sources. Much of this has subsequently been exported from China, particularly to markets which prohibit illegal wood-based products – reflecting how lightly those markets’ legislation is being implemented. 2 If makers of “rosewood” furnishings in China need “first class” species in the form of logs not sawn wood, and if, as is almost universally the case, the export of logs of those species is prohibited, then these enterprises are the primary drivers of illegal supply. Prices (and demand) for sawn wood would rise if those enterprises choose not to procure illegal logs. 3 If one were to credibly determine the volume of particular species (e.g. jambire) which could be felled in Mozambique without jeopardising that species’ survival, it would not be surprising if that volume were much less than the roundwood equivalent volume which is currently being exported. 4 Is it poor forest governance, rather than the ban on log exports, which is “decreasing the value of Mozambican exports”? I am an international expert on illegal logging and associated trade and assisted with a recent study on illegal logging in Mozambique. recognise the reality of the logging sector in the country. Firstly, log smuggling is only one among many common and serious breaches of regulations, and recent studies have found that at least two-thirds of all harvesting is illegal. Most of the logs which are being smuggled out of Mozambique in contravention of the export ban were also illegally produced. Lifting the log export ban would thus simply legalise the export of illegal timber. Secondly, the research and the key recommendation fail to recognise that total harvesting in Mozambique is far in excess of sustainable levels – massively so, for the handful of species being smuggled abroad as logs. If you legalise the exports, then you legalise the rapid extermination of these species and the end of any chance of building a viable industry. Thirdly, aside from being unhelpful in terms of broader goals, lifting the log export ban would almost certainly fail to achieve even its immediate goal, of reducing illegal log exports. Given the widespread illegality in the sector and past experiences (studies dating back as far as 2003 – four years before the log export ban – already showed massive amounts of log smuggling), it is almost certain that companies will continue to smuggle or mis-declare their logs in order to avoid paying taxes. 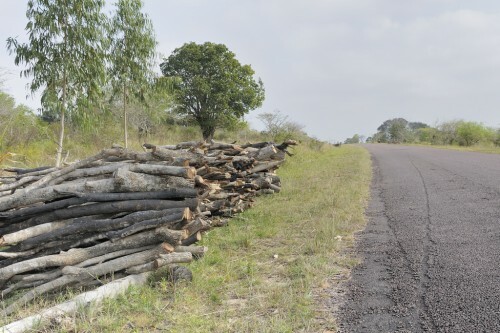 Finally, the research fails to appreciate the challenges of enforcement in forestry, which mean that legalising log exports might actually make it harder for the Mozambican government to bring rule of law to the sector. It is much less risky for illegal loggers if they can export whole logs. Processing facilities can be seized and shut down. If all log exports are illegal, then it is much more difficult to launder illegal logs. And it is very hard for the government to police harvesting, so simple rules and proper enforcement at crucial bottlenecks such as ports is the most realistic way that the industry can be brought under control. The log export ban is also making it easier for third parties to monitor and measure illegal activity, and making it harder for the Chinese government to deny accepting imports of illegal wood. Though Mozambique didn’t impose the log export ban in order to help tackle illegality, there are strong arguments that it should retain it for that reason alone. Indonesia banned the export of logs to make enforcement simpler and it worked. (including CIFOR’s own research) show that while most logging companies have a harvesting license, they are breaking just about every other law and regulation it is possible to break. They are not doing this because the laws make it impossible to profit legally – they are doing it because they can make much more money if they break the laws. They only obtain harvesting licenses in order to provide the token sheen of legality which the minimal level of governance in the sector demands. At present, whether they have these licenses or not is almost irrelevant In terms of the economic and environmental viability of logging in the country. The reality is that lifting the log export ban because companies have been blatantly violating it would serve only to reward illicit behaviour, setting an awful precedent in terms of other forest regulations. Unless and until there is rule of law in Mozambique’s timber sector, legalising log exports can only serve to accelerate the destruction of the country’s forests. Instead of considering such a counter-productive step, the Mozambican government would do better to consider the recommendations resulting from a multi-stakeholder workshop in September last year, organised by UEM as part of its study on illegal logging. These include a moratorium on new logging licenses, improved transparency of relevant government information, the creation of an new centralised enforcement agency, third-party forest monitoring and increased bilateral cooperation. Above all, however, what is needed is increased political will to tackle the problem. Contrary to what the second paragraph of this article implies, (tropical) African timber is unlikely to be a substitute for the timber which was being logged in China prior to implementation of China’s Natural Forest Protection Programme. China’s imports of logs from Mozambique doubled during the six years 2007 to 2013, fluctuating considerably in between. China’s imports of sawn wood from Mozambique increased by the same volume but from a much lower base. The primary driver of this apparent demand is the ready availability of highly profitable, and therefore presumably illegal, wood raw material. Secondary drivers probably include forest exhaustion in range states for substitutes of the species which China imports from Mozambique and governance in Mozambique declining relative to that in those other range states. China’s imports of illegal wood-based products, particularly those which are transformed in China for subsequent export, will continue until legislation is robustly implemented in the countries which prohibit products made at least partly from illegal raw material (notably the USA, the UK and other EU member states). However, readers should not hold their breath while waiting for this to happen.